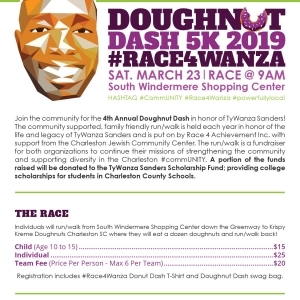 Join the community for the 4th Annual Doughnut Dash in honor of TyWanza Sanders! The community supported, family-friendly run/walk is held each year in honor of the life and legacy of TyWanza Sanders and is put on by Race 4 Achievement Inc. with support from the Charleston Jewish Community Center Without Walls. Individuals will run/walk from South Windermere Shopping Center down the Greenway to Krispy Kreme where they will eat a dozen doughnuts and run/walk back! Jumping castles will be provided by Charleston Jump Castles as well.